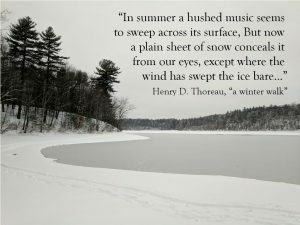 The Walden Soundscape website is a toolbox for educators and students to engage in a natural soundscape alongside works of literature that inspired early activism in the wilderness preservation movement such as Henry David Thoreau’s Walden (1854) and Ralph Waldo Emerson’s Nature (1836). Making original images, videos, and sounds available to the public for free online, this project brings an immersive experience in nature to a wide audience. The project is part of my dissertation on the impact of sound and sonic vibrations on the American Transcendentalists, who were interested in maintaining harmony with nature (in a musical sense of active, reciprocal participation) and who understood music to be an experience not limited to the hearing world. The website is made up of three sections. The first section contains immersive stop-motion animated videos including guided walks through Walden Woods and meditative experiences reflecting on the pond in real time.This immersion adds significantly to visitors’ understanding of natural soundscapes and how they have influenced American literature, politics, and philosophy. Moreover, it encourages visitors to meditate on the tranquility of nature, as Thoreau and Emerson did, and this can help, in part, to ease the anxieties of a busy work life and increase environmental consciousness. A second section features an ArcGIS story map of the pond for individual exploration of the sonic environment surrounding the pond in the woods, the marsh grasses, and by the neighboring railroad tracks. Visitors will find that airplanes, cars, and trains often interrupt the serene soundscape and this challenges them to critically reflect on how drastically Walden Pond’s soundscape and landscape have changed since Thoreau drew his survey map. The map content will be transformed into a new interactive design created in Neatline by 2019. The third section of the website features a podcast that uses sounds and critical listening methods to educate listeners about Sound Studies, Thoreau, climate change, and Transcendentalism. The “sonic boom” of sound studies in the humanities, particularly in literary studies, calls for a new approach to “listening” to a text, especially when the text was written prior to recorded sound. This “boom” comes at a critical moment when wild soundscapes are rapidly disappearing. Sound is a vehicle for Thoreau’s environmentalist politics. For instance, he writes at the end of “The Ponds” chapter in Walden: “My Muse may be excused if she is silent henceforth. How can you expect the birds to sing when their groves are cut down?” (132). His lamentation is not only for the birds amid deforestation, but also for the music of the American soundscape that was disappearing then and is disappearing still. The opportunity to listen for a distinctly American Muse was at stake for him and is still at stake today.